The Jumpinjax in the first picture was very successful as an invitation to a pantomime. If you are running a fun event then you must consider the exploding Jumpinjax as the event invitation. At the heart of the product are four pop-up cubes which are powered by rubber bands. 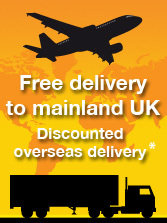 These are compressed and loaded onto a tray which is slid inside a sleeve along with a couple of information cards. When your customer opens the Jumpinjax, out jump the four cubes to create a big surprise and a lot of fun. The fun surprise of the Jumpinjax is obviously what gives the product its obvious attraction but the fact that there are so many surfaces on which to print also gives it great versatility. It is an excellent ice-breaker as a handout at exhibitions and trade shows and helps to keep the exhibition visitor on your stand. The pack itself is very solid and chunky and it feels good in your hand so it is not going to be either ignored or discarded when handed out at an event. The Jumpinjax promotional pop up box has a slide-out tray which, when pulled, releases 4 pop-up cubes which shoot out with a sort of "rat-tat-tat-tat" action and noise causing a great surprise. There is plenty of room for promotional print on this excellent business communication product; your custom-printed message is on the two information cards in the tray and the the outer pack. 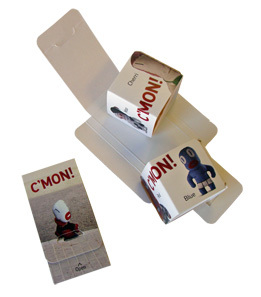 Since its launch in 2007, the Jumpinjax has become one of our most popular promotional pop-ups. 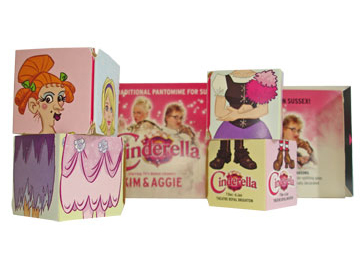 The Jumpinjax is a real good fun promotional pop-up product which packs a big surprise. Imaginative graphic designers will have loads of fun with this one! One very creative marketing idea was to use the Jumpinjax pop-up product to promote the Grand National which proved perfect for horses going over the jumps. The Jumpinjax has been used to great effect as a trade show giveaway in addition to a pop up mailer as the pop-up mechanism creates a surprise and a laugh which helps to get a conversation going between sales staff and potential customers. Suggestions for marketing ideas for the terrific Jumpinjax advertising product include: Jack in a box; crackerjack; spring; rabbits; hare; kangaroos; fleas; jump jet; frog; toad; leaps and bounds; Jumping Jack Flash; leap frog; fireworks; box of tricks; explosive; scatter gun; gun fire; cannon ball; dynamite; scatter. 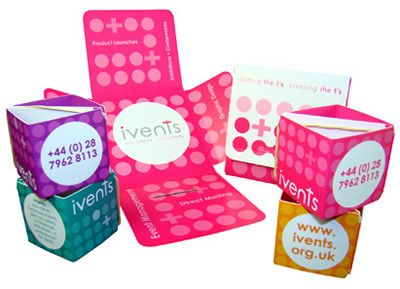 The Jumpinjax pop up mailer normally has four cubes which makes it perfect for promotions involving the number four – four seasons, four star, four points of a compass; however you can have less if it suits your campaign better.